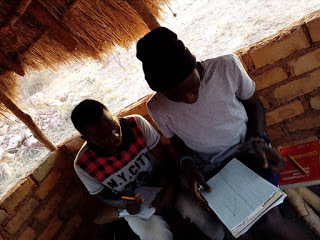 During the holidays, April and August, in 2018 we had the opportunity to attend the Our Moon tuitions in Chibombo. This program was facilitated and coordinated by Justin Mushitu, Helen and Our Moon students. 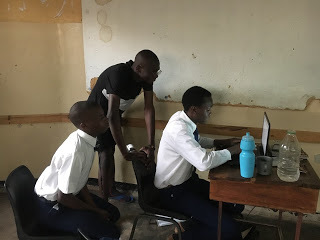 Our experience with the Our Moon scholars (Hillcrest and David Kaunda Technical Secondary School [DK]) was both intimidating and enlightening. We felt like we were working with professionals, and that was nerve-wracking for us. We would always think about how very little we had done in our academic lives when contrasted with the Hillcrest and DK pupils’ endeavours. We learned about the A-Levels and how to get ready for them. This made us more determined to do even greater things and not in the academic compartment alone. 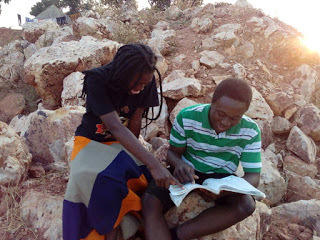 These interactions opened up our minds to diverse ways of approaching studies hence improving our study techniques. KF Alum Justin assists Philip with his studies. Interacting with the Our Moon scholars was very impactful, and it felt like it was needed for the growth that we experienced. We learned a lot about academics and the experiences that they had overcome to reach that stage. Working in such groups helps you build your confidence and the attention you receive from your peers is very important for you to open up and accept errors. Faith works with an Our Moon student. We worked with past papers primarily and although the approach was not entirely new, it was the most past papers we had ever worked on. This proved to be helpful to us, because we got more acquainted with how to answer examination questions. 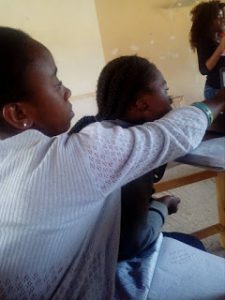 One of the many things we enjoyed during the program was the peer tutoring approach. We were free to express our misunderstandings, our disagreements and our views in a different way because we were working with people in the same age-range as ours. We were advised to be ourselves, and everyone was expected to do their best and be as helpful as possible. It was a nice team-work experience that we would want to experience every day. This peer tutoring in terms of working collaboratively was very helpful. Mercy works with an Our Moon student. 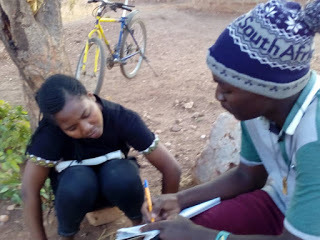 To improve the efficiency of our peer tutoring, we started an activity called “teach what you don’t understand or don’t know.” This was to motivate each person in the group to study the topic so that they could teach us. It also helps other students easily notice where their errors were and correct them. Cecilia and Faith during a “Teach What You Don’t Know” exercise. The most changing aspect about the tuitions for us was Khan Academy. It was a challenging but fun way of learning that we enjoyed immensely. The quizzes, tutorials and the rewards afterwards were very helpful to our confidence in preparing for the sciences. Using Khan Academy was amazing, because it simplified things, and we learned things in a short period of time, meaning that we learned a lot of things in the process. We wish we had started earlier. Chalo had not offered tuitions for a long time. After experiencing Our Moon, we, the KF students, decided to share what we had learned from Our Moon. Chalo was ready to provide us with more internet access, text books and one-on-one remedials with our teachers. Study groups were enforced and our ideas on how we could learn better were taken seriously and then implemented. The tuitions also changed the approaches of Chalo teaching by trying to make the school (Grade 12s) study using Khan Academy. Cararise works with an Our Moon student. Because of the tuitions, we were able to gain confidence, especially in mathematics. The Hillcrest students told me that if we could muster up even more confidence, then we were halfway towards good grades, and they were right. The tuitions also made us work hard because of the results we were getting during the tests I used to write. The Our Moon program affected our results positively because we were given the experiences of full examination papers. We owe our results to the Our Moon tuition program. 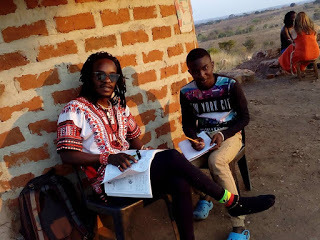 The tuitions affected our results positively in that it polished up on the topics that we did not understand in school, which would have created a big challenge in the exam. Our results without the tuitions would have been good, except not as good as they are now. We feel like we went to the tuitions primarily to gain confidence in ourselves and get comfortable with our strengths. Therefore, we think that our results would have not been as good without them. Vincent works alongside an Our Moon student. We feel that the impact of this partnership is the exposure to a more challenging way to approach learning and is based on personal challenge. The Hillcrest and DK students are amazingly brilliant and KF pupils associating with them is putting great minds together. The partnership between KF and Our Moon is very essential because it is exposing us to different places with different conditions which is making us stronger. 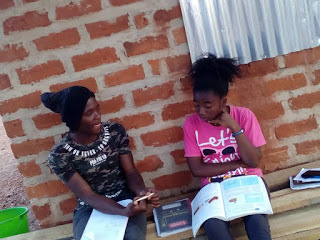 Not only that, the peer tutoring is good because of the interactions with the tutors from different schools and different ideas about careers and many others. The partnership should continue. It will connect KF to more university opportunities and also enable students to be involved with other children with high goals. Also, like us, some KF students will experience personal challenge and be able to gain or re-gain morale in their examinations. This will teach KF students how to survive and thrive in different conditions. Furthermore, this will brighten their future because of the good results they will obtain through the help of Our Moon organization. We think the partnership should continue because as it proved to be a great success on the 2018 Grade 12s. We are sure it will do even better for the upcoming students in helping to secure their futures with good grades.